I may be a girly girl, ya know pink birthday cake to match my pink manicure, and long blonde curls for days, but I bleed orange and blue. I am a tried and true Knicks fan, always have been always will be. I look forward to Fall solely for the return of basketball season, and brunch in the city. But mainly basketball season. So, the NBA lockout was tortuous for me. But now, the NBA is back and I am back in my Knicks gear. But, a simple Knicks tee isn’t enough to show my pride today. Today, I sport my excitement with food. 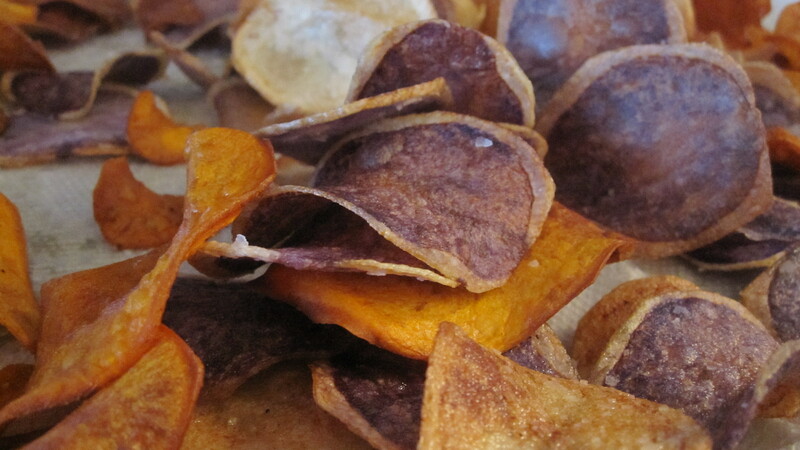 Blue and Orange Potato Chips. Genius right? I know, they should totally sell these at The Garden. But hey, MSG, if you do, please name them after me? Thanks! And what would chips be without dip? Lonely, that’s what. 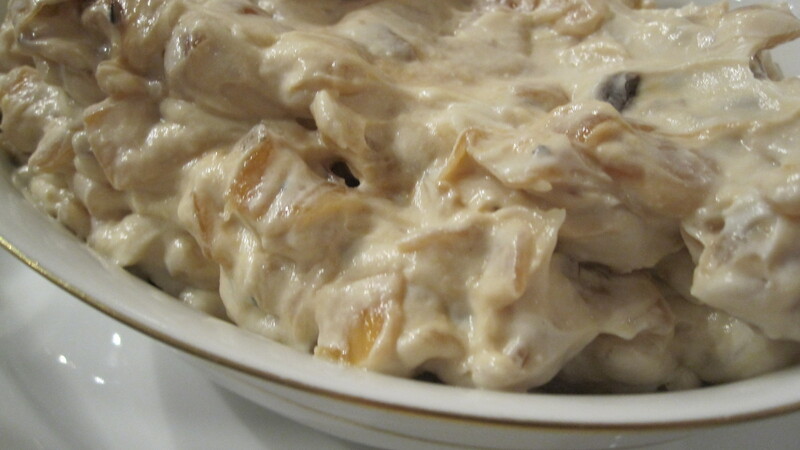 So, I’ve made a Homemade Caramelized Onion dip to go alongside the chips. Add the vegetable oil to a fry pan and heat over medium to high heat. Wash and peel your potatoes. 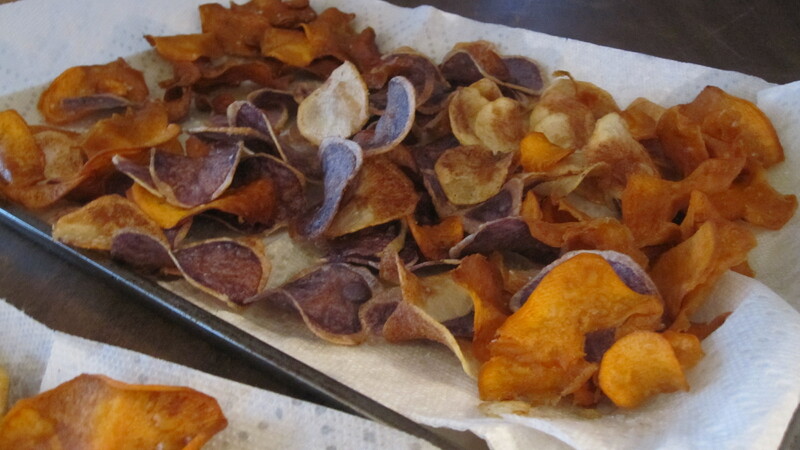 Then, using your mandolin, carefully slice the potatoes thinly. 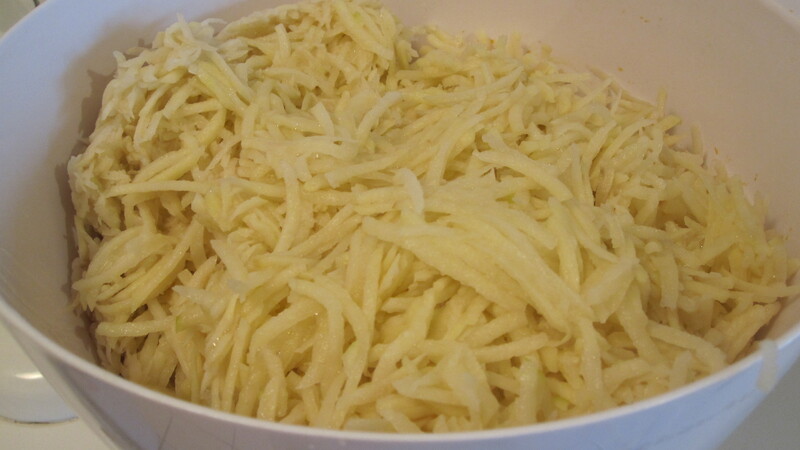 Place the sliced potatoes in a bowl of water until you are ready to fry them. 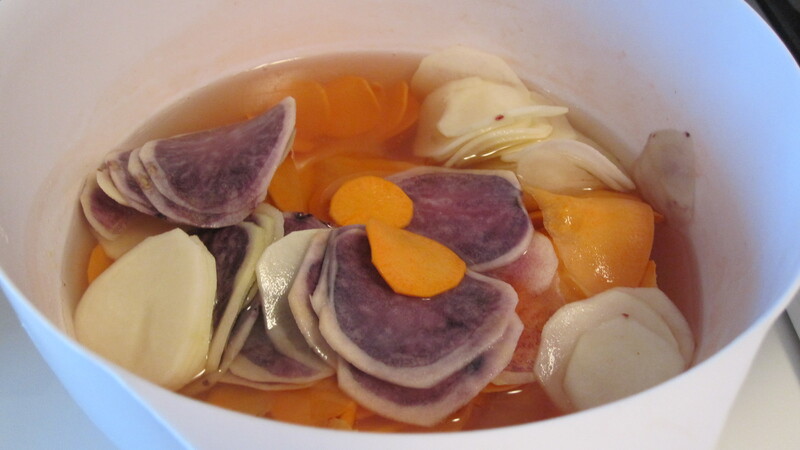 Once all of the potatoes are sliced, the oil should be ready. 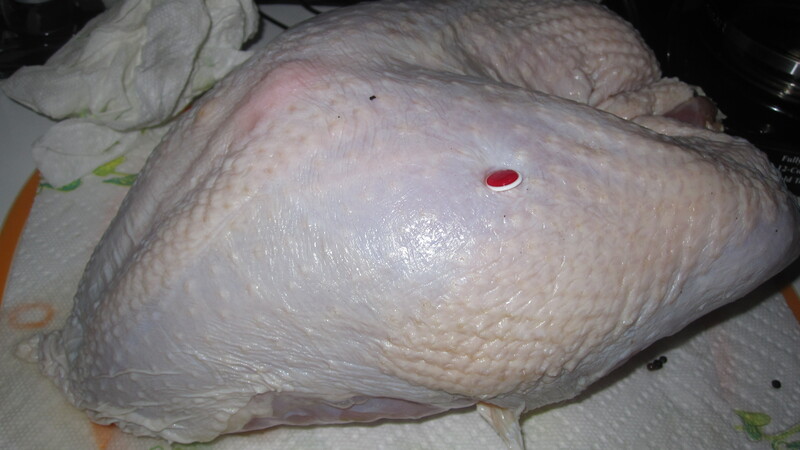 If you have a thermometer, check to make sure the oil is around 325 degrees. If you don’t have a thermometer, the best way to check the oil is by frying a potato. Just use one slice as a test. Place it carefully in the oil. The oil around the potato will begin to bubble. The potato will begin to brown. You know it is down when the oil stops bubbling. It’s like nature’s own alarm clock. If the test potato comes out well, fry up the rest! Make sure not to overcrowd the pan or the temperature of the oil will go down, leaving you with mushy potatoes. 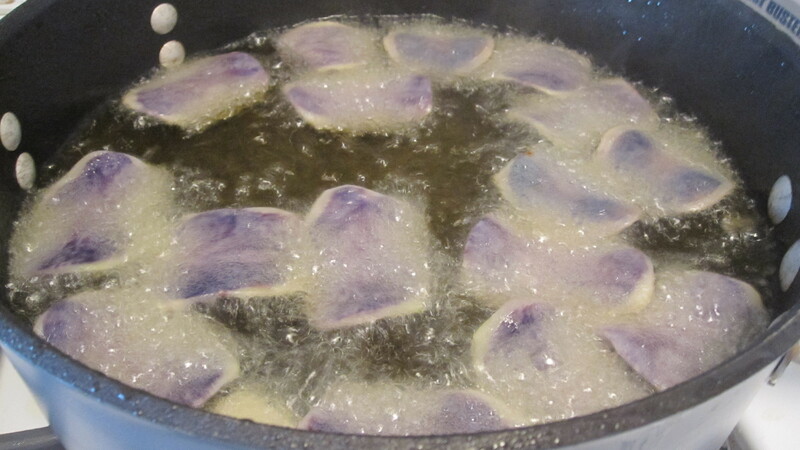 Once the potatoes are golden and crispy, remove them from pan and place them on a paper towel lined sheet tray. Dust them with kosher salt. Place in a bowl to serve. Enjoy! 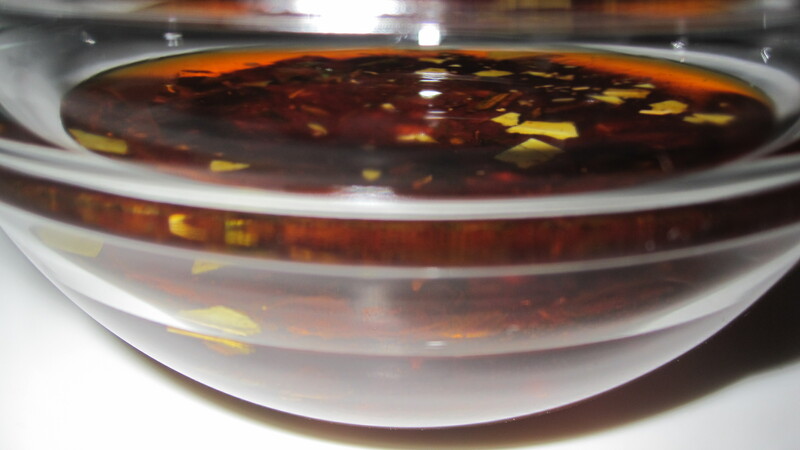 In a large killet, heat olive oil over medium to high heat. Add the onions and a few pinches of salt and saute until the onions are caramelized. This should take approximately 40 minutes. Then, set the onions aside to cool. 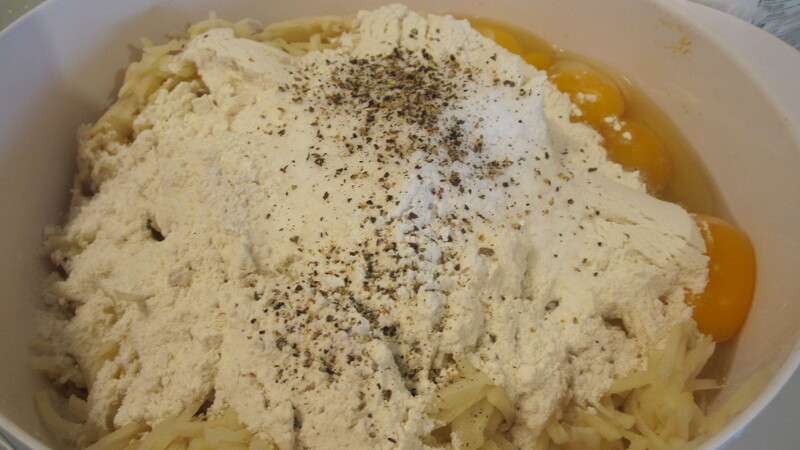 In the meantime, mix together the sour cream and yogurt. Add the garlic powder and a pinch of salt to taste. Then, add the onions and mix to incorporate. Chill until you are ready to serve! Last night, I had one hell of a Chanukah party. The champagne was flowing, the caviar was chilled, the latkes were piled high. It was a great night with great friends and family. So great, in fact, that I dreamt about it. So, when I awoke, I was still thinking about latkes. But isn’t that truly the test of deliciousness? When you dream about your food. Sure is. Leftover latkes are incredible. 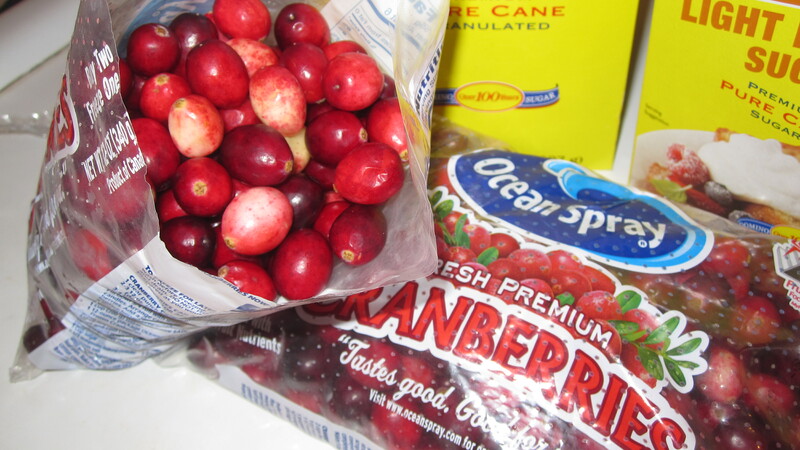 If you have a lot, you can pop them in the freezer and defrost at your leisure. Or, if you are like me, and eat 15 at a time, you probably won’t have any latkes for the freezer. I never do, because I eat them for breakfast, lunch and dinner. 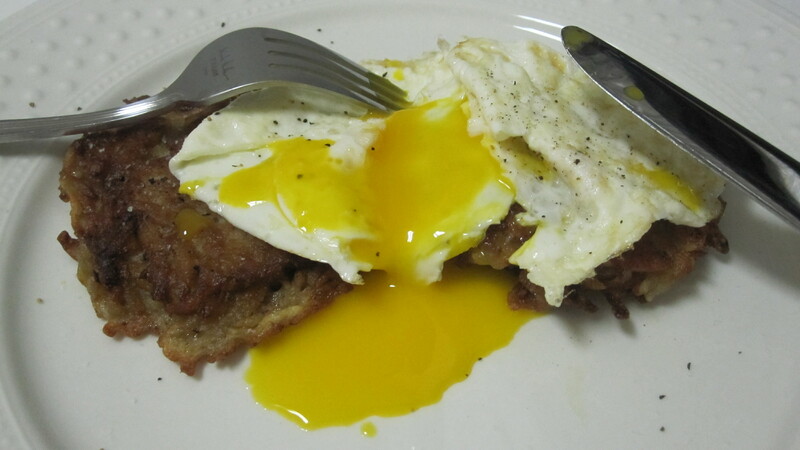 Breakfast Latkes are some of my favorites. 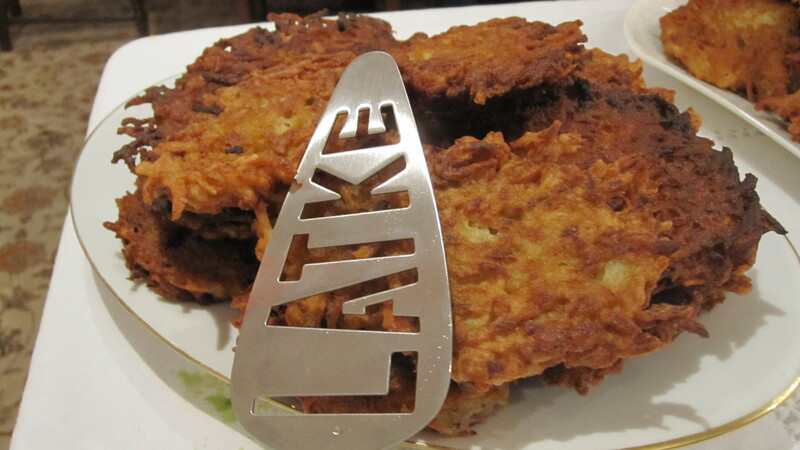 The latke is like a hash brown, but better, because it’s a latke. So, it’s an egg-cellent base for eggs. Get it? Happy Chanukah! So, last night was the night, the big night. And by big night, I mean my big Chanukah party. I’d prepped all week. After you saw my Thanksgiving prep, did you really expect anything else? Right. So after a week of prep work, I was finally ready. While there was lots of yummy stuff on the menu, there was clearly one leading lady and that leading lady was the Latke. 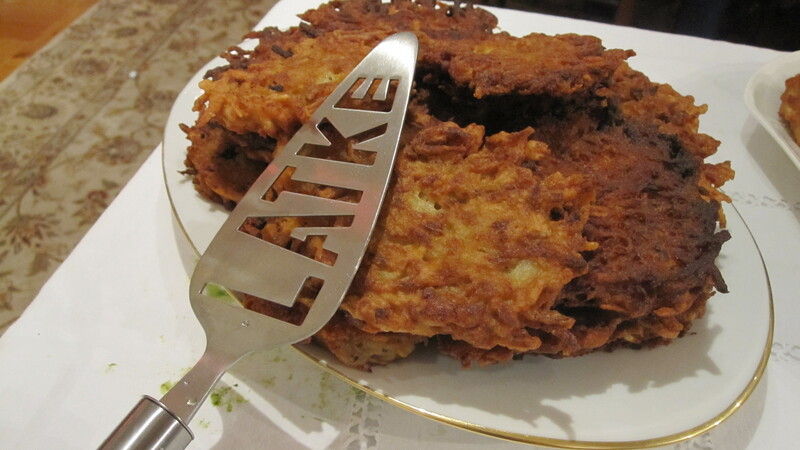 Although I celebrate Chanukah with the 3 C’s, champagne, caviar and chocolate, none of these means of celebration would exist at my party without the latkes. 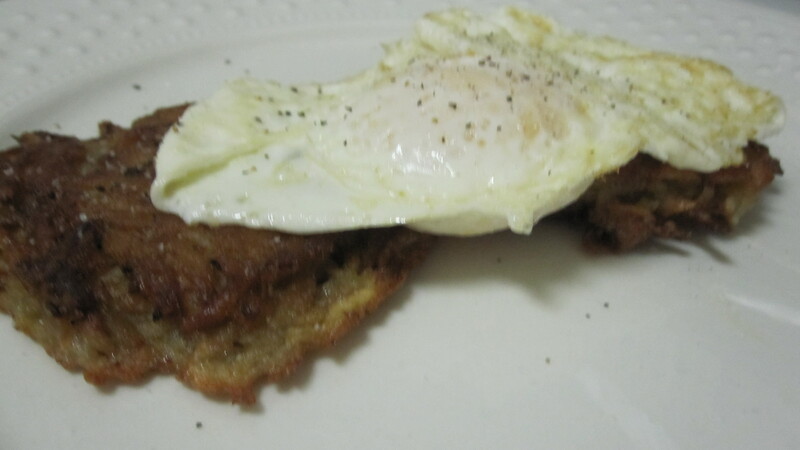 My latkes, like many of my other recipes are easy. Well, easy with a food processor. 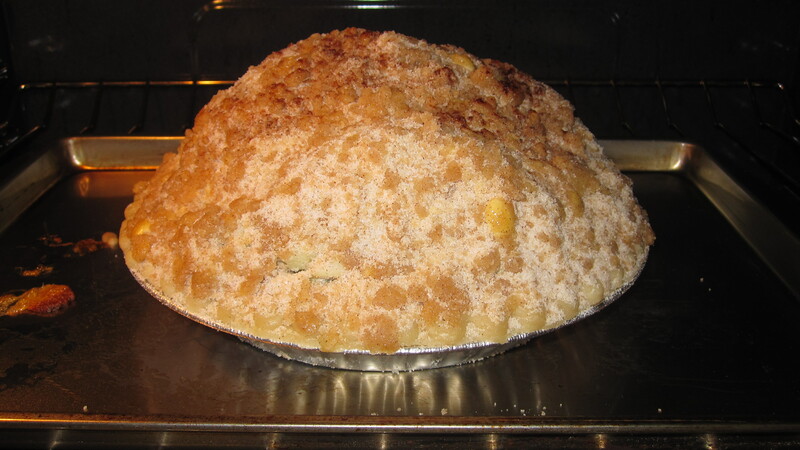 If you are grating potatoes by hand, and make it through 10 lbs. without fainting, well that’s really a Chanukah miracle in itself. 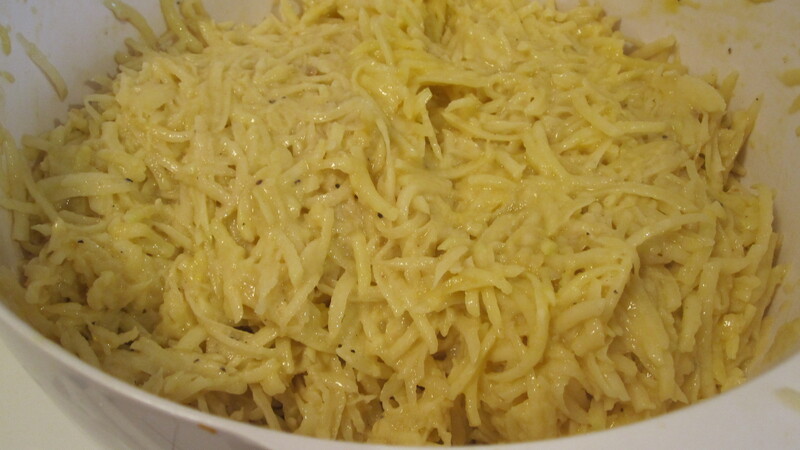 Combine the potatoes in a bowl with the egg, flour, salt, and pepper. Mix well. I recommend using your hands. 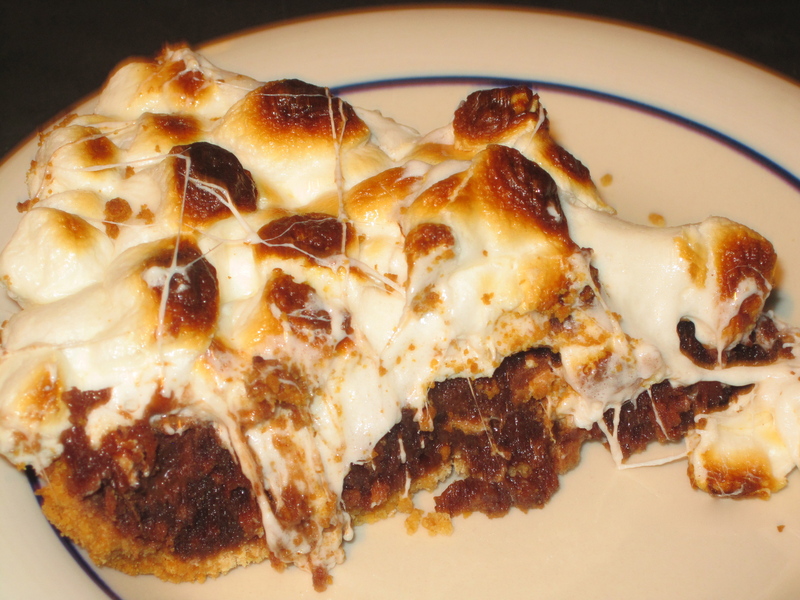 It’s fun, it’s messy and it’s really the best way to get all the ingredients incorporated. Add oil and a little butter to a skillet over medium to high heat. 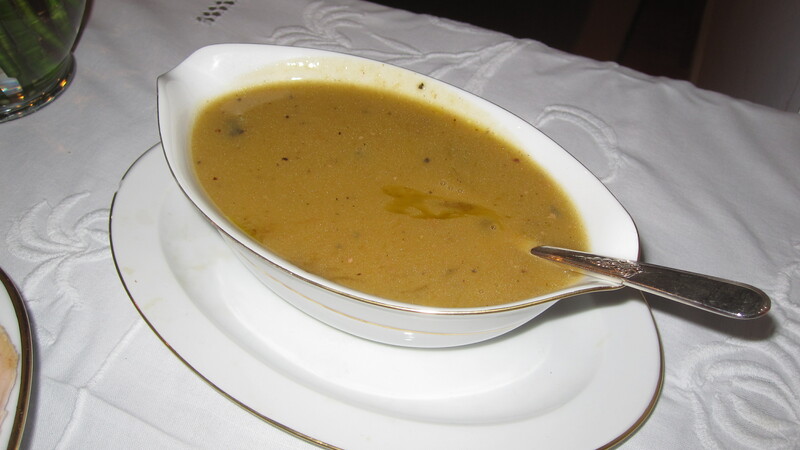 Drop a heaping tablespoon of the potato mixture into the sizzling butter and oil. I like big, thick latkes while my Dad likes them to be thin and crispy. So I change up the amount of potato mixture I add the pan to create different size latkes. Feel free to play around! 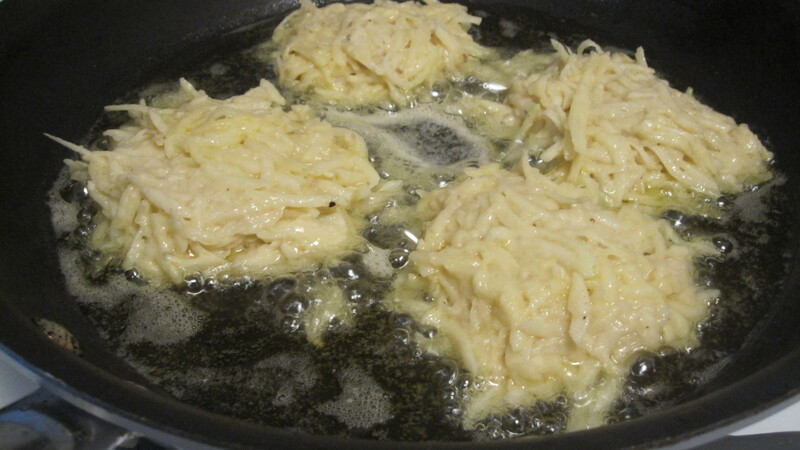 Flatten the latke with a spatula and cook for approximately, 2 minutes or until the bottom is golden brown. Flip the latke and then flatten again. Cook for approximately another 2 minutes, until crisp on the outside and golden brown. 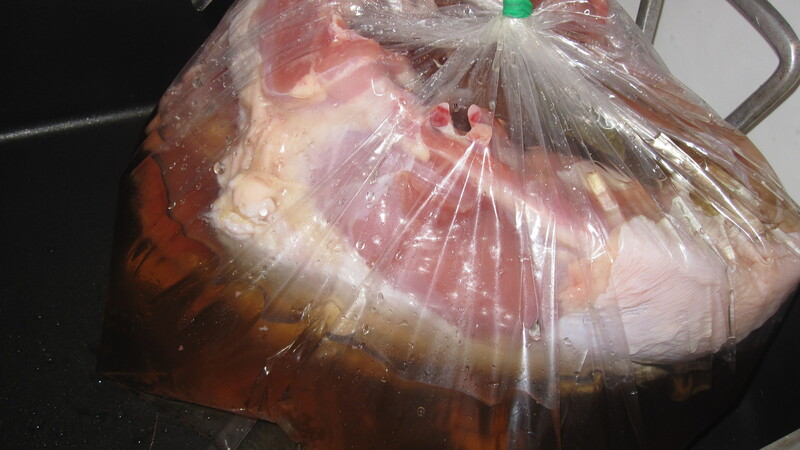 Remove from the pan and set aside on a paper towel absorb some of the excess oil. 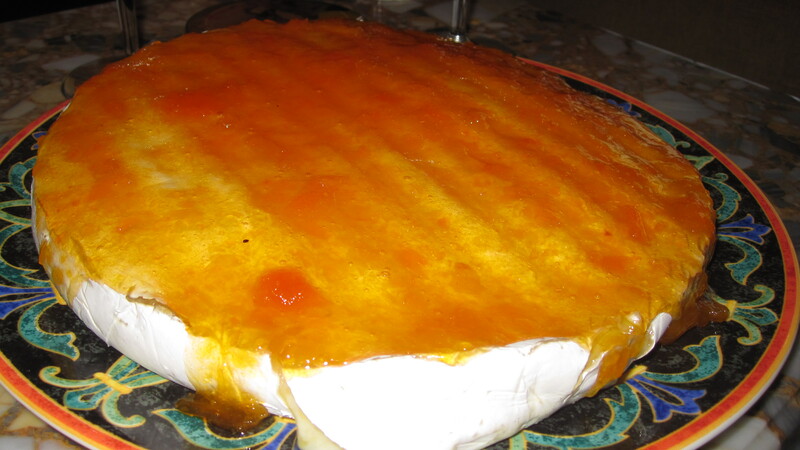 Serve with apple sauce, or the Bite-Sized way, with a dollop of sour cream and a touch of caviar! Chanukah is my favorite holiday, well really second favorite. Obviously because Halloween is my first. But I guess if we are only talking holidays in terms of religion, Chanukah is my number 1. Wait, who am I kidding? Candy is a religion. Halloween is still my number 1. But I really do love Chanukah. Now, I know what you are thinking; Chanukah is my favorite because I get eight presents. Well both my parents can attest to the fact that that’s just not true anymore. So what makes this holiday so special? Everything, that’s what. But, if I had to narrow it down I could choose 3 choice words to describe this holiday: champagne, caviar and chocolate. I bet that’s not what you were expecting me to say. But since when is this Bite-Sized Blonde predictable? While predictable I’m not, I am traditional. And I mean that in the sense that I create traditions and then follow them. 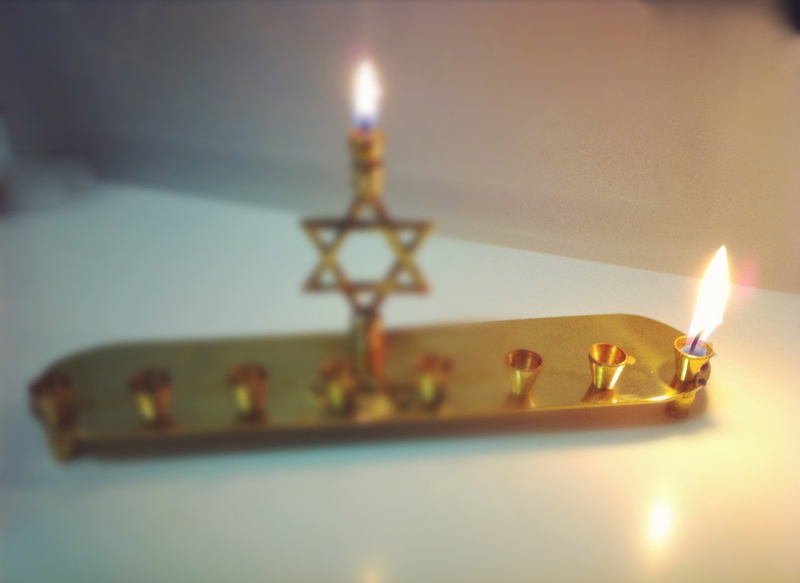 So, for me, Chanukah tradition is all about the three C’s. Champagne is somewhat obvious. I told you once, a party just ain’t a party without a little of the bubbly stuff. And Chanukah is one hell of a party. You certainly cannot celebrate, especially a miracle, without champagne. I think that’s considered sacrilegious. 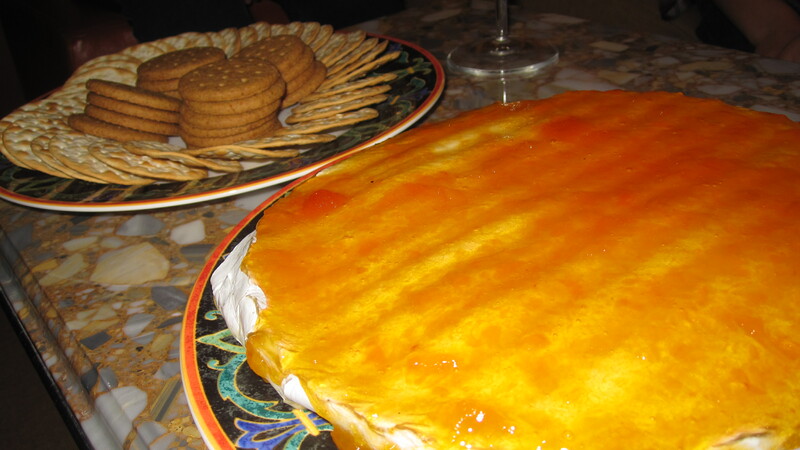 Caviar – also a celebratory food, but that’s not the reason you’ll find it at my Chanukah table. 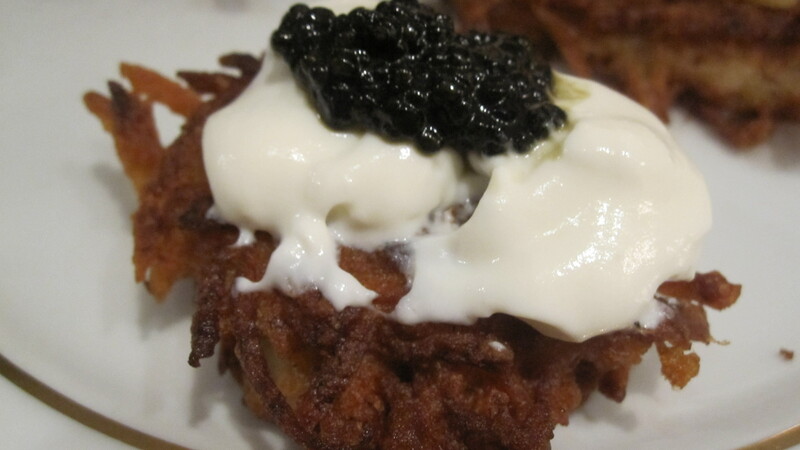 Caviar is salty, which offsets the greasy latkes perfectly. With just a hint of sour cream, it’s really the perfect pairing. If this tasty treat sounds awfully familiar, it’s because it’s kind of like a blini, but better. And in case it didn’t sound familiar at all, and know you’re wondering what a blini is, I’ll tell you. A blini is a pancake typically topped with crème fraiche and caviar. 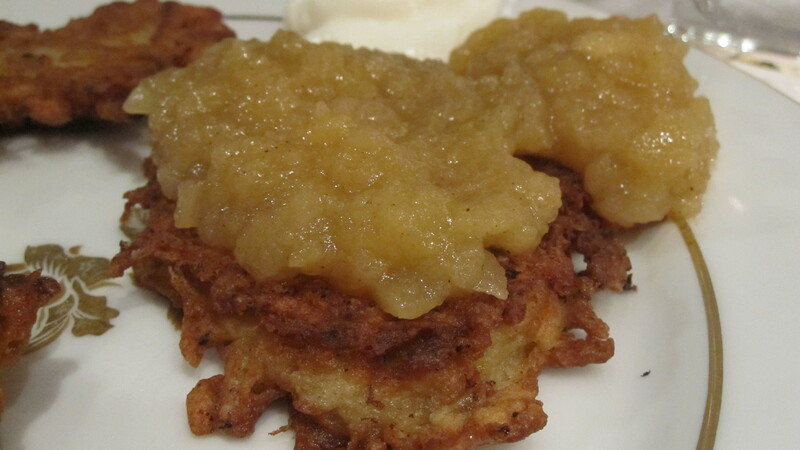 What makes my Chanukah blinis great, is a great latke as a base. Now chocolate. Chocolate is as much a part of Chanukah as dreidles. Hello…gelt. But, if you’re anything like this Bite-Sized Chocoholic, gelt isn’t enough to calm your cravings. So, we end our Chanukah celebration with even more chocolate. 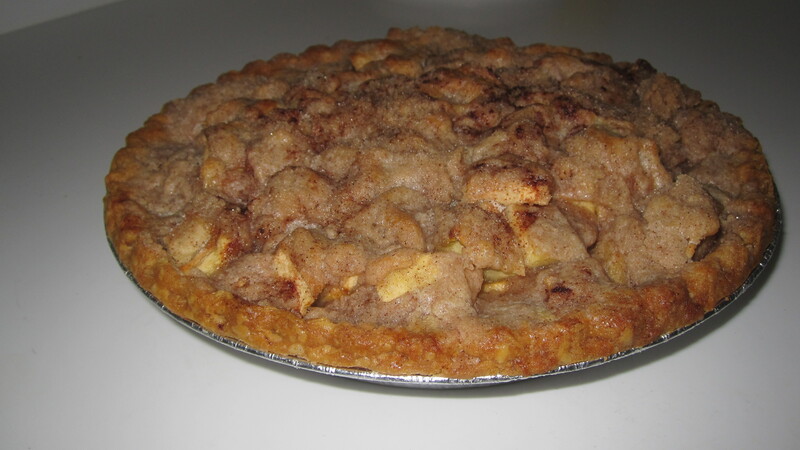 I hope your mouth is watering. I know mine is. But what I really also hope is that you have a wonderful Chanukah! Stay tuned this week for recipes, and of course, a photo recap! Ughh, that’s the only sound I can make right now. Probably because I am still so full. Oh, the beauty of stuffing your face for 3 straight hours. Well, one more thing I’m thankful for this year, is that this feast only happens but once a year. I have been promising you photos all week, and boy do I have a lot of them! I hope you enjoyed your Thanksgiving as much as I did. 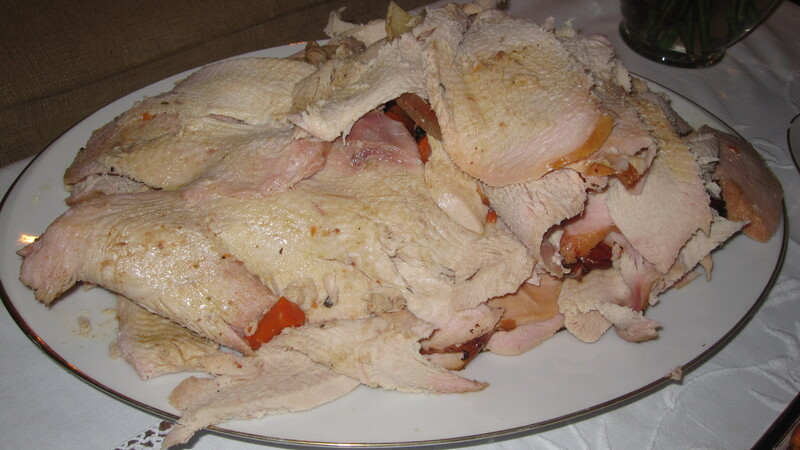 And if you are still hungry for more, I have serious leftovers. Twas the night before Thanksgiving, and all through the house, were scents of sweet dishes that were sure to arouse…Seriously though, my apartment smells fantastic!! Today was my first official day of cooking and baking in preparation of the feast, excluding the ice cream making I did last week. And man, am I ready for tomorrow or what. I mean mentally ready, cause damn I’m tired. But I still have a few more dishes to finish off tomorrow. 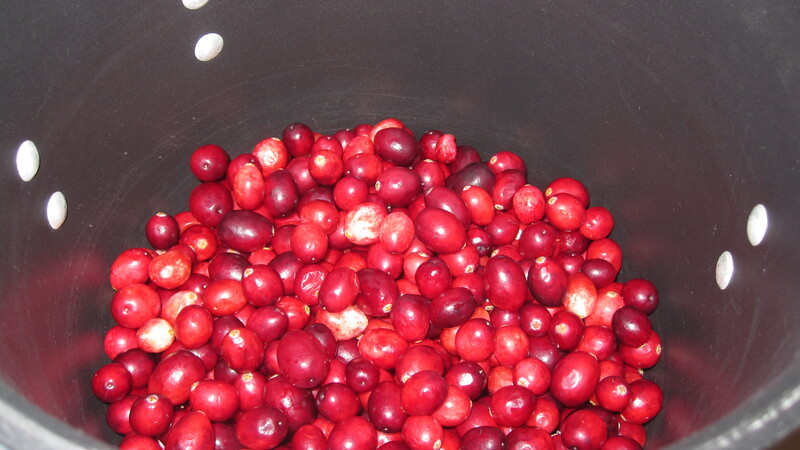 Cranberry sauce is a staple at the Thanksgiving table. But, it can be kind of boring. So, I put a Bite-Sized spin on this classic dish and added alcohol. 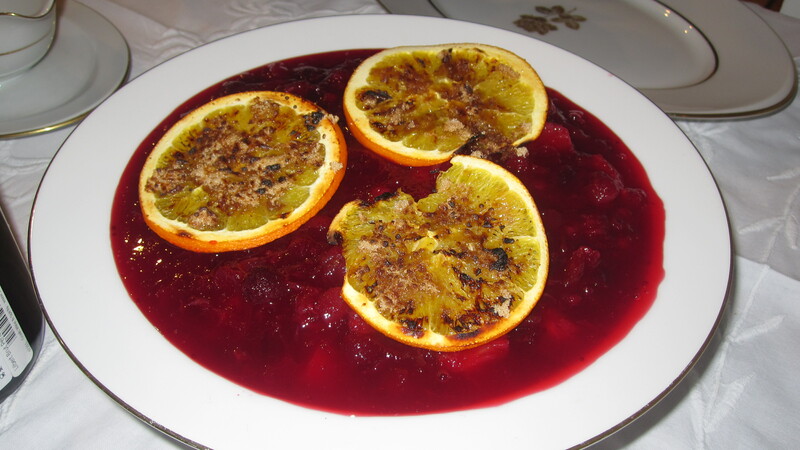 Now the dish is delish and has it’s own catch phrase: “Cranberry sauce you can get sauced from.” Okay, I’ll work on the catch phrase, but this cranberry sauce really is spectacular. 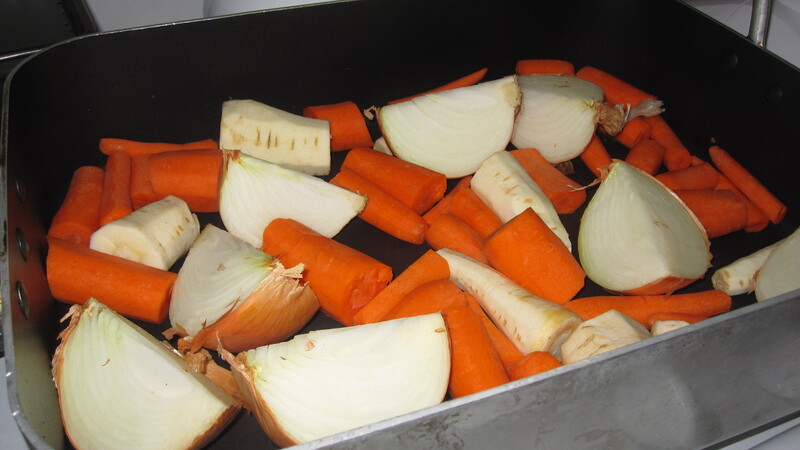 Place all of the ingredients, except the orange, in a sauce pan and cook on medium – high heat for about 15 to 20 minutes or until most of the liquid has reduced, stirring occasionally. 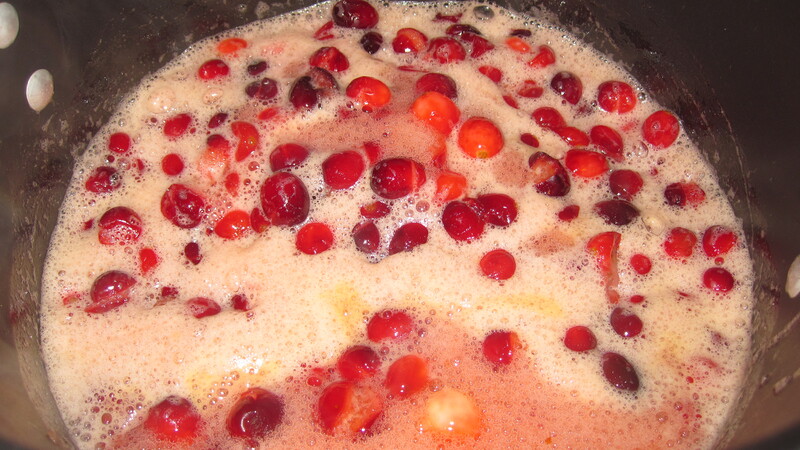 You will hear the cranberries pop, which is a good thing! 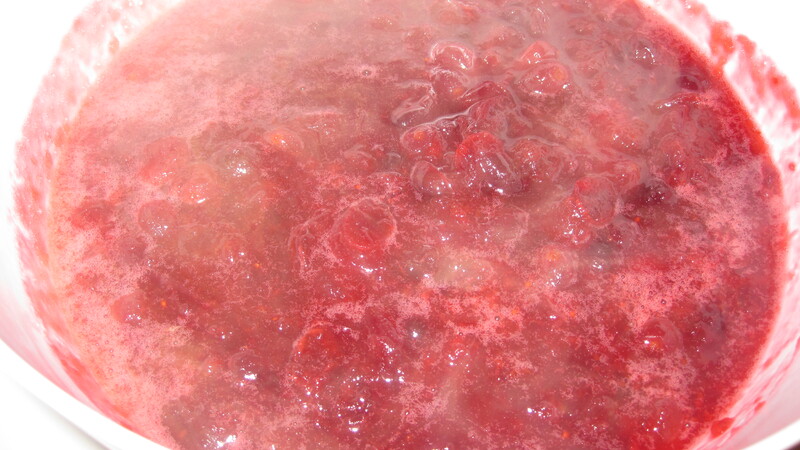 Once most of the liquid has been reduced, remove from the heat and let cool. 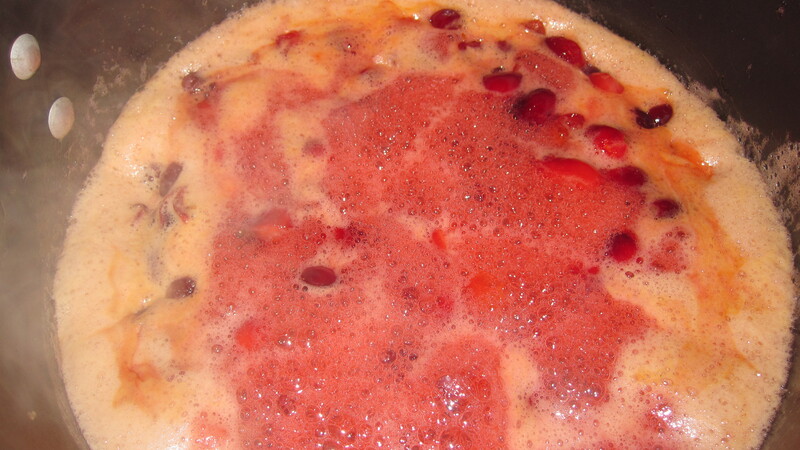 While the cranberry sauce is cooling, segment 1 orange. To segment the orange, slice off the top and bottom of the orange. This will give you an even surface for cutting. Cut off the peel, including the white pith. Try not to remove too much of the orange along the way! 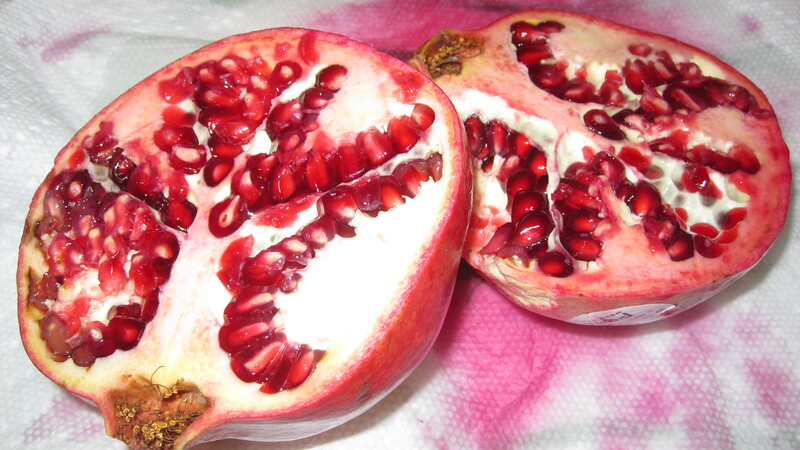 Cut the orange between the membranes and remove the fruit. 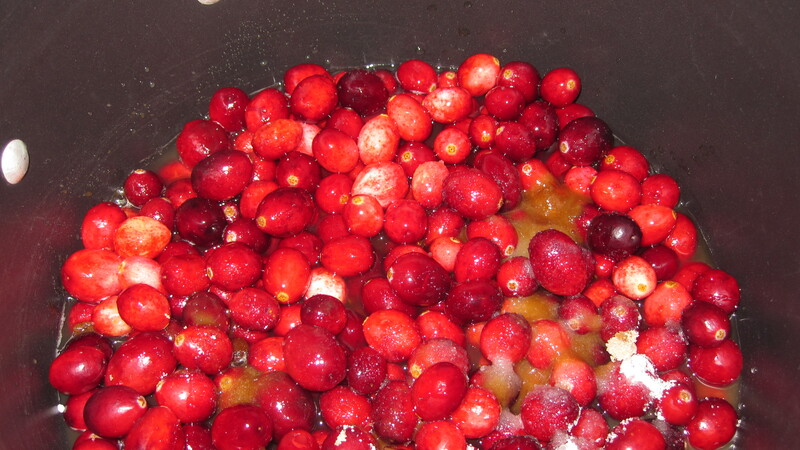 Then, cut into quarters and add to the now cool sauce. Cool the sauce in the refrigerator until it’s time to serve. Presentation is 9/10ths of the law, the law of eating that is. So to make this sauce look even better, I brulee a couple orange slices to add to it. First, thinly slice half an orange. Lay out a few slices on a baking sheet. 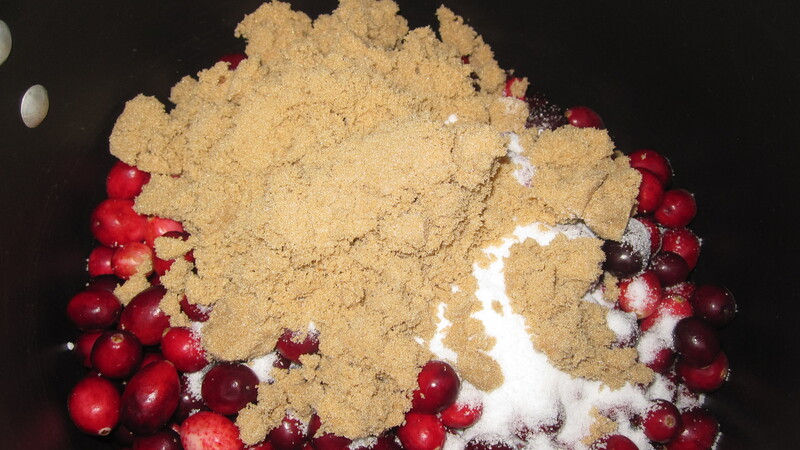 Sprinkle liberally with sugar. 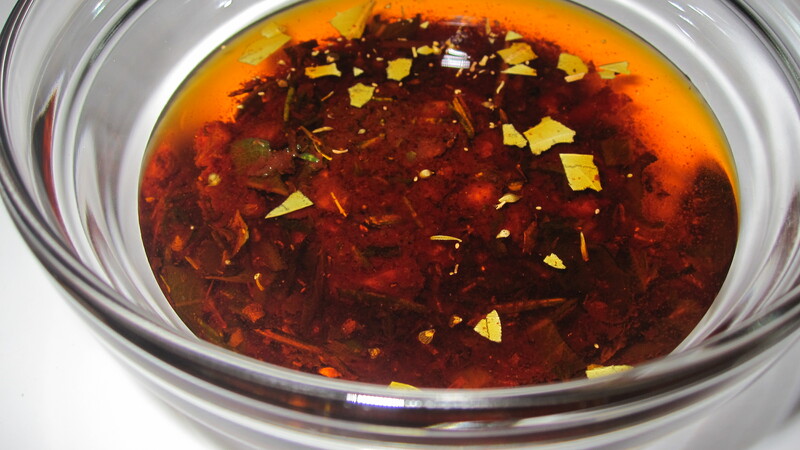 Using your kitchen torch, brulee those babies and add them to your sauce as a garnish! 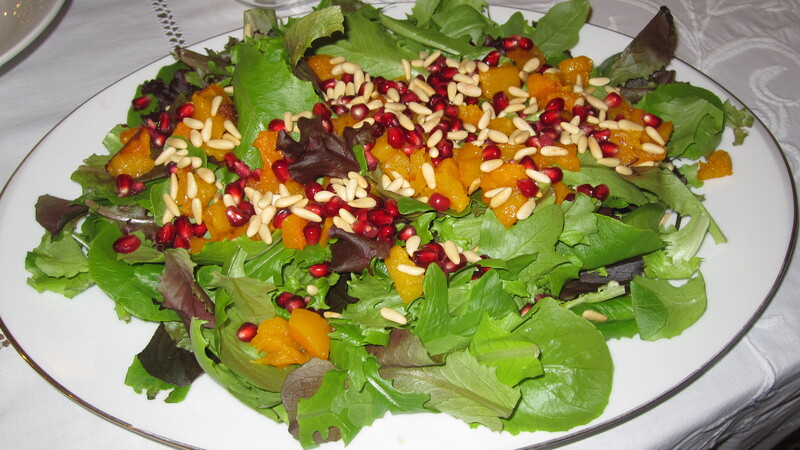 Another Thanksgiving staple, that is totally one of my favorites, is Sweet Potatoes. 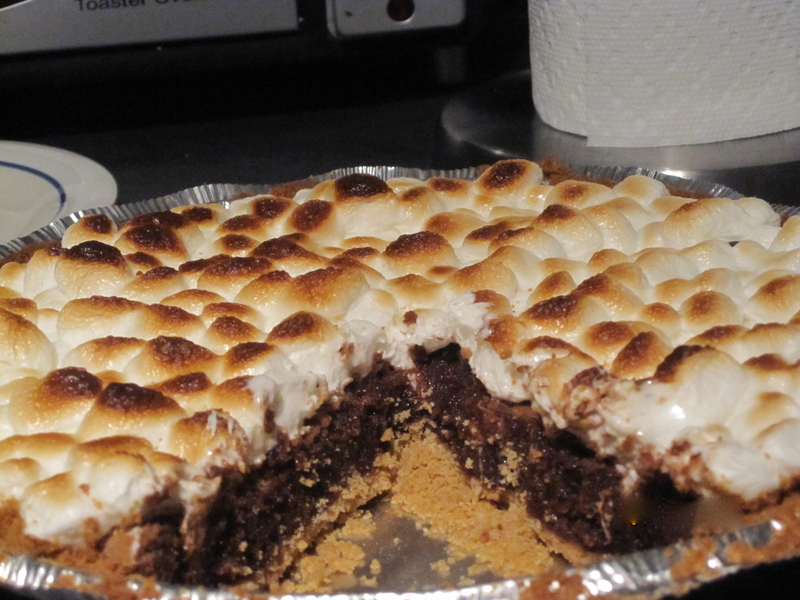 But like I told you before, I’m not adding any marshmallows to this dish. Instead, I’m making Coconut Ginger Mashed Sweet Potatoes. 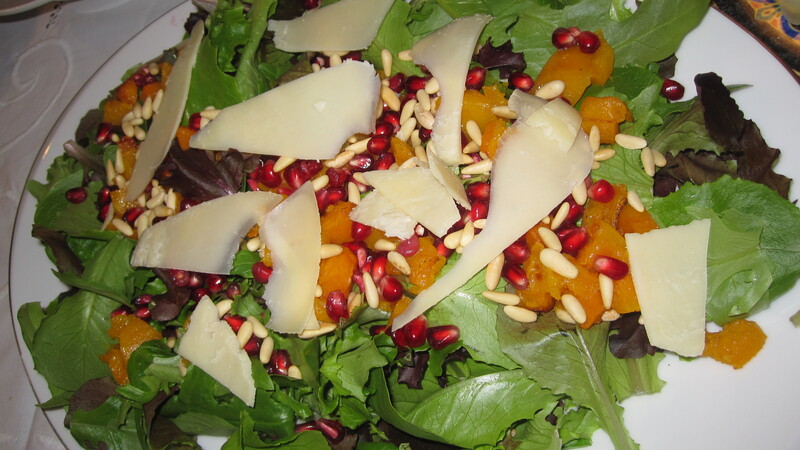 Sounds a little funky, but I promise this dish will be huge hit around the dinner table. Trust me, and if you don’t trust me, then trust Heidi Swanson, author of www.101cookbooks.com, where I found this intriguing recipe. Preheat your oven to 350F degrees. 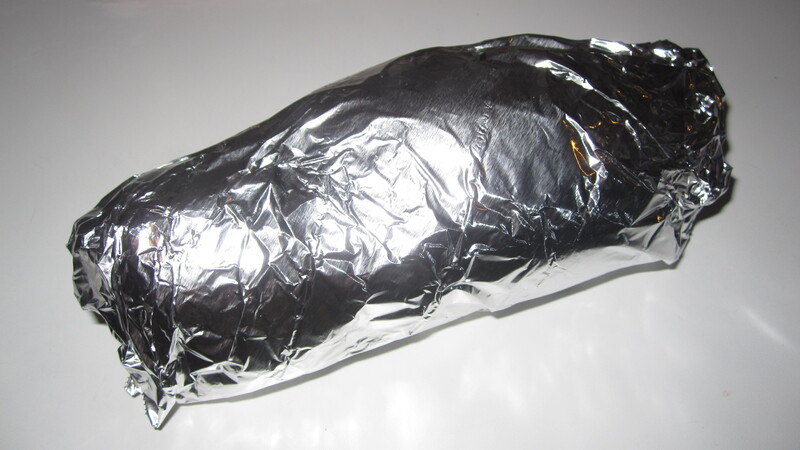 Pierce each sweet potato numerous times with the tines of a fork and wrap in foil. 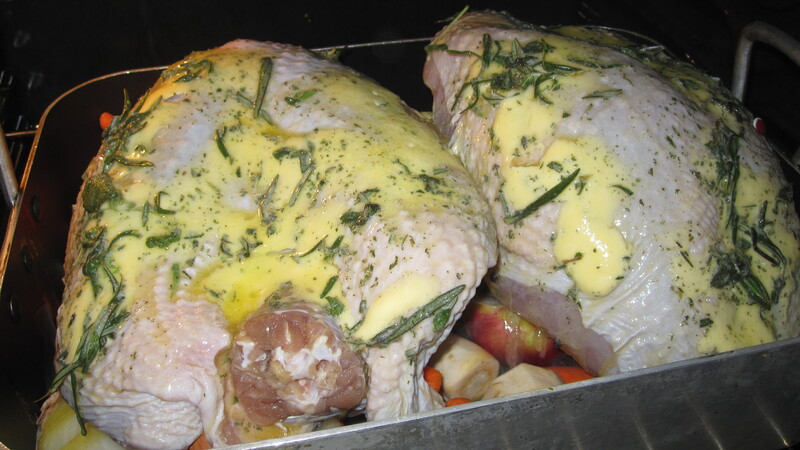 Place in the oven for somewhere between an hour and an hour and a half, until each is baked through. 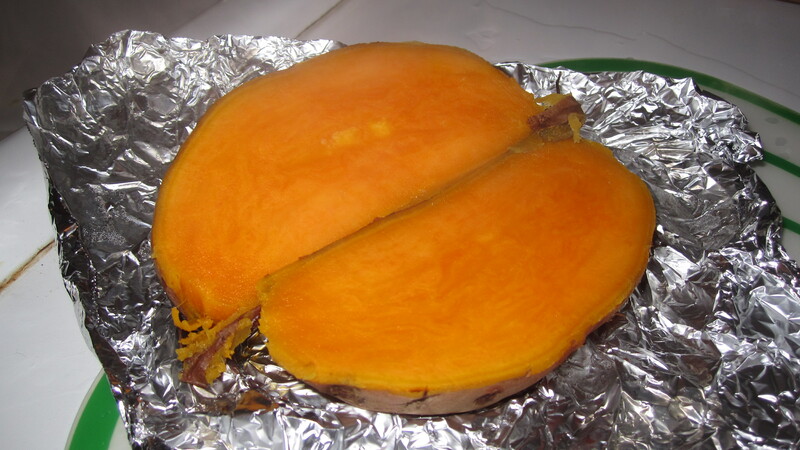 Times vary greatly depending on the size of your sweet potatoes – in the end you should be able to cut through the center flesh as if it were soft butter. 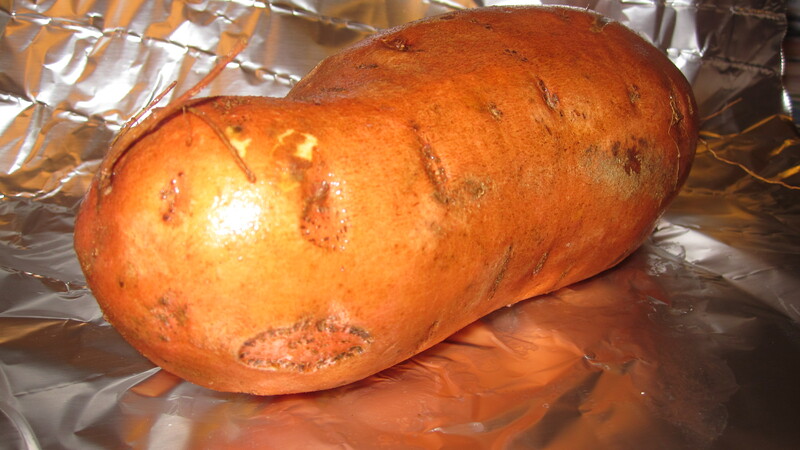 Remove the potatoes from the oven, let them cool for a few minutes, and cut each sweet potato in half. 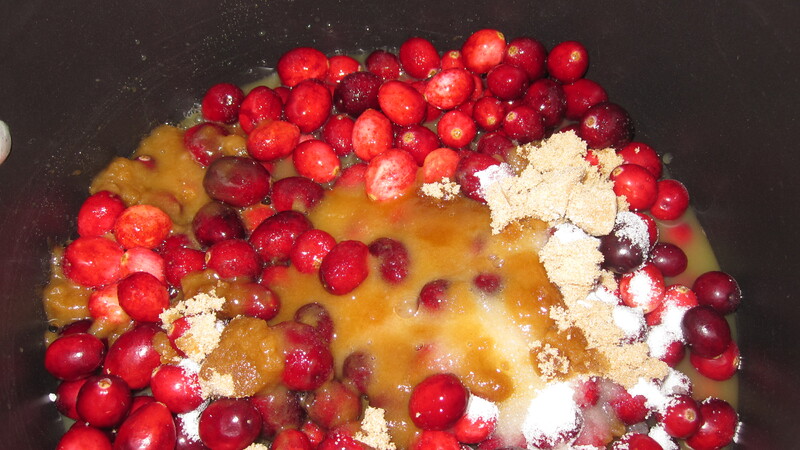 Scrape the flesh into a medium mixing bowl. You should have about three cups of sweet potatoes. 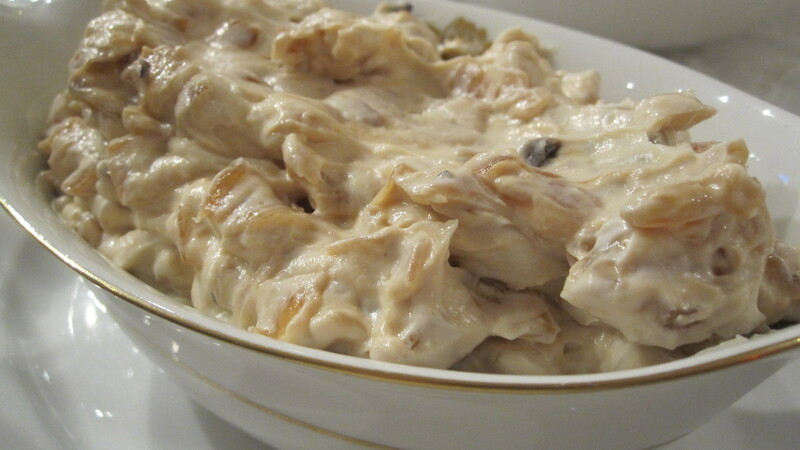 In a large bowl mash the sweet potatoes with the coconut milk. Stir in the ginger, maple syrup and salt. 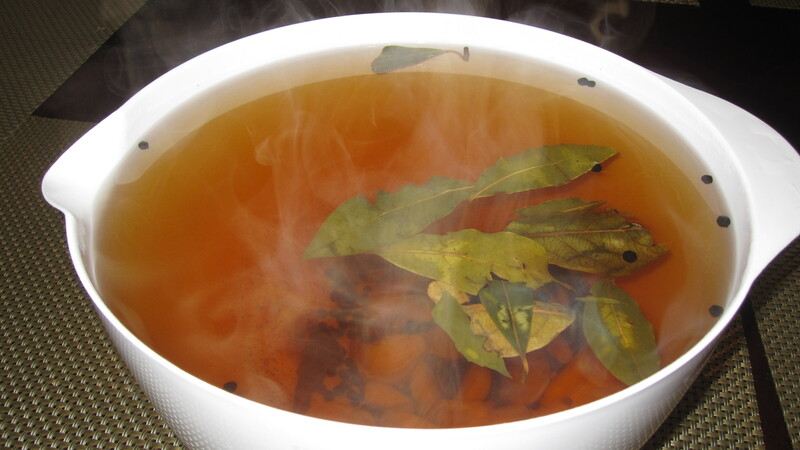 Let it sit for a few minutes, stir again and taste – adjust the seasoning if you need to. 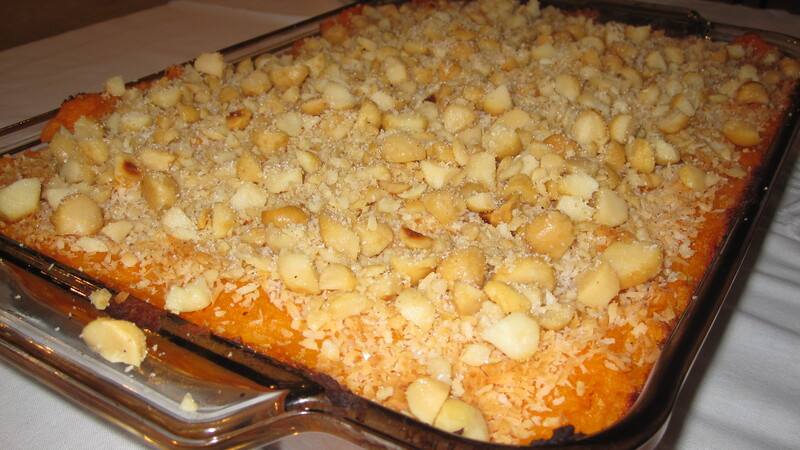 Spoon the sweet potato mixture into a large baking dish, sprinkle with coconut, drizzle with olive oil and bake uncovered until warm and the coconut golden roughly 30 – 40 minutes. 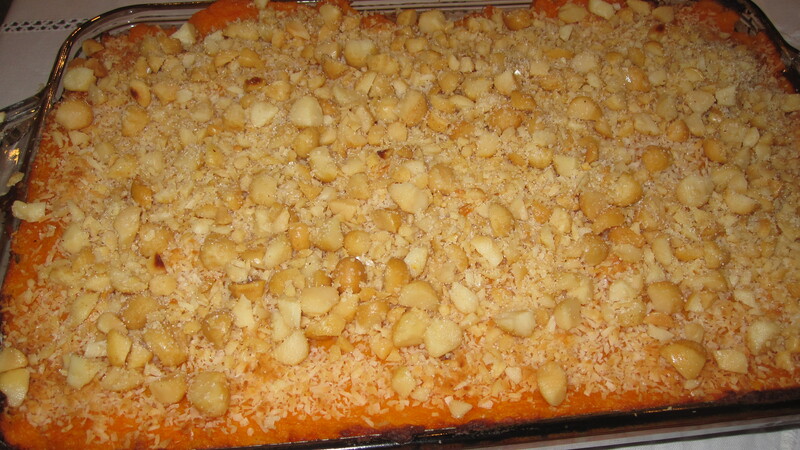 Remove and sprinkle with the toasted macadamia nuts. 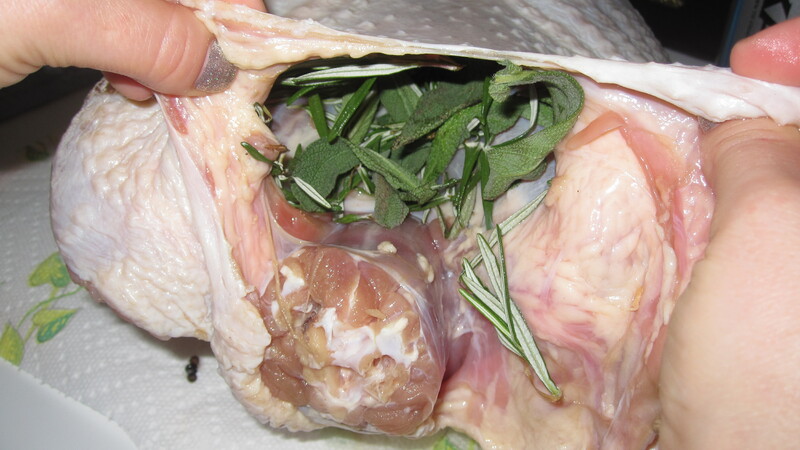 Still waiting on that Turkey recipe, huh? Well, guess what? You are going to have to wait one more day! 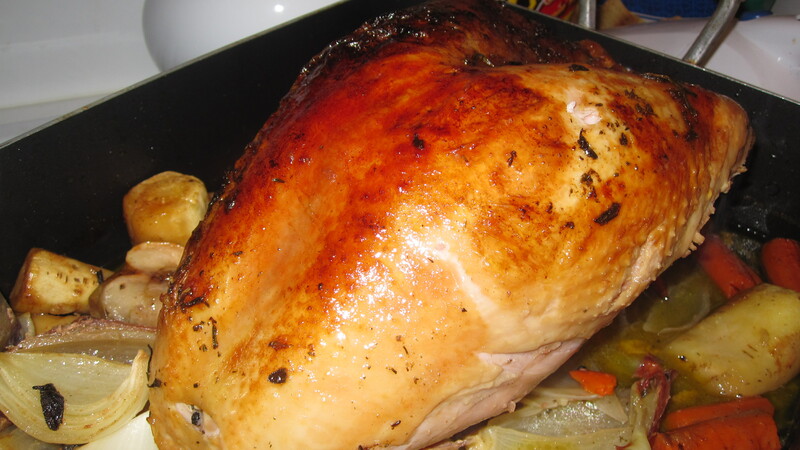 Tomorrow wouldn’t be Turkey day without a Turkey, now would it?